Spring is around the corner, which means it’s almost time to celebrate one of the greenest holidays around: St. Patrick’s Day. Whether you and your family is Irish or not, March 17th is a fun excuse to come together, celebrate, and maybe even learn a little something while you’re at it. So don your favorite shade of emerald and take a look at this list of fun family activities to make your St. Paddy’s Day extra lucky this year. This game is fun for the whole family, and couldn’t be easier. Find the most appropriate treasure holder you’ve got—bowl, box, bag, anything—and bonus points if it’s green. Fill it with gold chocolate coins, hide it somewhere in your house, and send the kids on a treasure hunt. If you feel like going above and beyond, write up some clues to make the hunt more challenging, create a makeshift rainbow, and put your “pot o’ gold” at the end. What’s not to like about the festive fun of a parade? Check to see if there will be a St. Patrick’s Day parade in your area and bring your kids to watch. Better yet, dress up in your best Irish garb before you go out—“Kiss Me I’m Irish” hat and all. 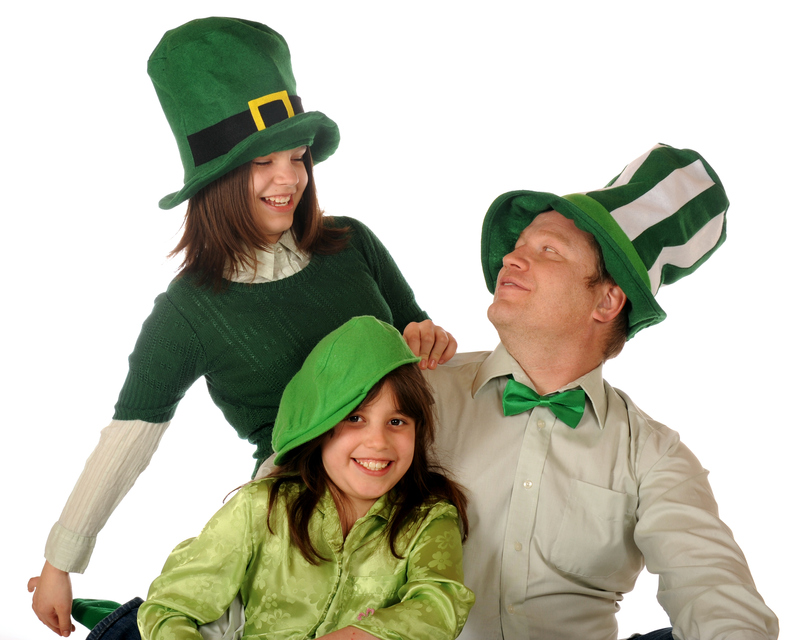 If your family does have Irish heritage, St. Patrick’s Day is the perfect time to teach the kids a little family history. Get together to look through old photos or tell family stories. Irish or not, you can also learn a little about the history of St. Patrick’s Day, and how it became a holiday here in the U.S. You can even give your kids a little quiz at the end to test their knowledge, and reward them with a chocolate coin or two. It may be hard to find your own lucky four-leaf clovers outside, but you can still make your own at home with your kids for a fun holiday craft. Cut shamrocks out of green construction paper or craft foam and arm your kids with glitter glue, markers, and stickers. Once the shamrocks dry, hang them around the house to decorate and celebrate your kids’ creativity.